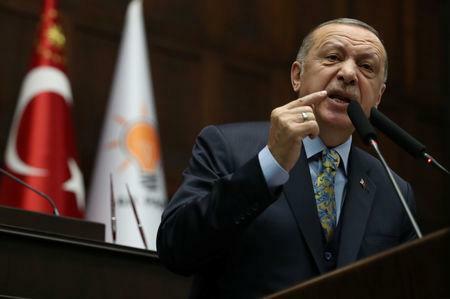 ANKARA (Reuters) - Turkish President Tayyip Erdogan said on Tuesday that he viewed a planned 20-mile (32 km) safe zone in Syria positively and added that its range may be extended further. Erdogan said earlier that he had discussed a safe zone which Turkey would set up in Syria during a phone call with U.S. President Donald Trump. Speaking to reporters in parliament, Erdogan also said he would most likely meet Russian President Vladimir Putin on Jan. 23.